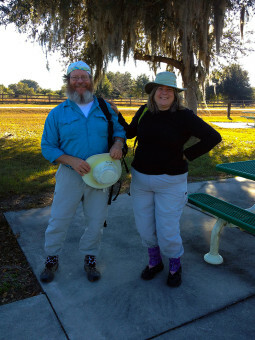 Hi, I’m Sandra Friend, owner / webmaster / chief content creator and a lifelong hiker. In addition to being a blogger and outdoor writer like my partner John Keatley, we are travel writers, too, which is why we need to be transparent about our business activities: not just to make the Federal Trade Commission happy, but to let you know we’re the good guys. Now and again, we’re provided free admission, free lodging, and sometimes even free transportation to visit places to write about. (Free food doesn’t happen often!) It’s a norm of our business, since getting reimbursed for the expenses of travel research is a rare thing indeed. We don’t, however, let these perks color our coverage. We tell it as we see it – or leave it out of the book (or blog) altogether if we think you won’t enjoy it. And yes, we really DO hike the hikes, ride the bike trails, and paddle the paddling trails. It’s what we do. We’ve started accepting destination information from you, the reader, but we vet it before we post it, and we let you know who provided it. As freelance writers trying to scrape together a living from many little scraps, we do try and make a little money from this website. Once in a rare while, we’ll be asked to write a little something for pay. You’ll see the words “sponsored post” in the tag if we do, and we’ll mention our sponsors in the post. We receive income from click-throughs as well. For instance, if you click on a book image and end up on Amazon.com, they pay us a little something above the buck or so we earn in royalties on each book. Some advertisers pay us a little percentage if you buy something from them. Our paid directory listings are provided as a service to connect you and outdoor service providers in Florida. Any paid listing will be clearly marked as such on its content page. Advertising and donations (monetary and in-kind) also help us cover the cost of running the site. However, this is not a nonprofit effort, although it feels like it sometimes. But we have volunteered for many nonprofits that help keep Florida’s outdoors a pleasant place to play, and will continue to do so as long as we are Florida residents. Thanks for visiting, and remember – a day in the woods always beats a day in the office!